This week Apple launched an urgent update of iOS (iOS 6.1.2) to end the problems that the software was causing the battery performance of some iPhones. Now the company is working overtime to polish other faults that have been left behind, as the problem with the password on the lock screen. We recall that iOS 6 allows us to skip the password for any iPhone by following a few simple steps . 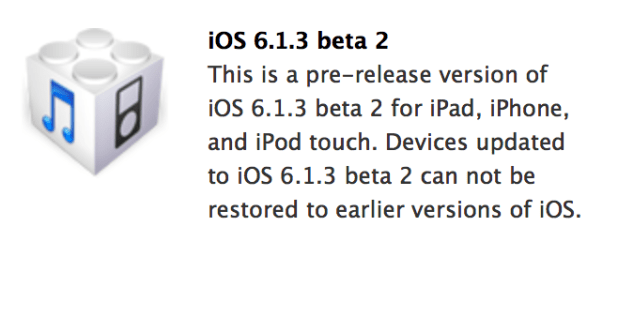 Yesterday, Apple published the second beta of iOS 6.1.3 which will bring numerous improvements to the maps of Japan. According to the developers who have had the opportunity to tinker with the software, iOS 6.1.3 ends the problem with the lock screen, so our iPhones again be safe when we block with a password. But this is not the only novelty. Apparently, iOS 6.1.3 also end up with the problems of Restrictions on "no changes" that we mentioned a few days ago in iPhone News : they would return to work correctly. Just one question to clear: if Apple closes security hole that evad3rs has been used to bring the jailbreak evasi0n. More- New security flaw: iOS 6 allows skipping the option "Do not Make Changes"
Article The new beta of iOS fixes security flaws was originally published in News iPhone .